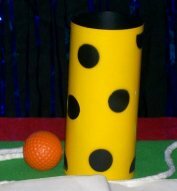 A yellow with black spots tube is shown empty. The magician then drops a ping-pong ball into the tube but it doesn't fall out. The magician explains that this is due to "heavy air." At his command however, the ball falls out the bottom of the tube. Rope, a magic wand, or other small object can be dropped into the tube with the same result!